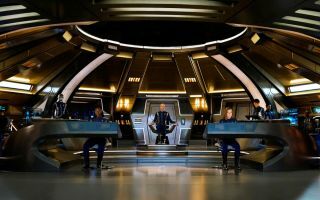 A view of the bridge during "Star Trek: Discovery" Season 1. "Star Trek" fans have been positively spoiled this week, there's no denying that. Not only did Sir Patrick Stewart announce his return as Jean-Luc Picard in a brand-new "Trek" series for CBS -during the annual Las Vegas Official Star Trek Convention this past weekend, but at the same event it was announced that Season 1 of "Star Trek: Discovery," the latest entry in the franchise, would be available on Blu-ray and DVD in just a few months' time. The trailer includes clips from the show along with behind-the-scenes featurettes in the four-disc set. Discovering Discovery: The Concepts and Casting of "Star Trek: Discovery" — Interviews with producers, writers and stars of "Star Trek: Discovery" about casting of the debut season. The "Star Trek" Theme — A discussion with executive producer Alex Kurtzman and composer Jeff Russo about creating the "Discovery" theme and score for the show. Creature Comforts — A behind-the-scenes look at the makeup and prosthetics department on "Star Trek: Discovery," as they both modernize well-known "Star Trek" species like the Klingons, Vulcans and the Andorians and bring to life a new species, the Kelpiens. The cover of the "Star Trek: Discovery" Season 1 Blu-ray. Designing Discovery — Insight into the production design department led by Tamara Deverell as they create the planets, the world within those worlds and the starships to travel among them. Creating Space — An exploration of how the VFX team, headed by Jason Zimmerman, pushes the envelope to create the reality of space, planets and starships for "Star Trek: Discovery." Prop Me Up — Led by prop master Mario Moreira, a voyage through the world of "Discovery" props, providing an inside look at the design process from inception to set. A Female Touch — With strong female producers and writers off-screen and powerful female characters on-screen, "Discovery" exemplifies the groundbreaking inclusionary theme first put forth in the original series. Dress for Success — Costume designer Gersha Phillips and her team create a spectacular array of clothing, uniforms and armor for every kind of species in the galaxy. "Star Trek: Discovery," The Voyage of Season e1 — A look at the adventures and plot twists encountered in the first season by the crew of the USS Discovery. In addition, the collection will include never-before-seen, deleted and extended scenes — everything a dedicated Trekkie could ask for. "Star Trek: Discovery" Season One on Blu-ray and DVD can be preordered now and will be available on Nov. 13 — making it the perfect gift to ask Santa for. The first season of "Star Trek: Discovery" is available on CBS All Access in the U.S. and Space Channel in Canada. It's available on Netflix in the rest of the world. Season 2 is filming in Toronto and will premiere in January 2019.